Lovely Victorian silver pommel with crisp Hallmarks, makers punch and retailers stamp. Mounted on three quarter bark, slim line Malacca shaft. 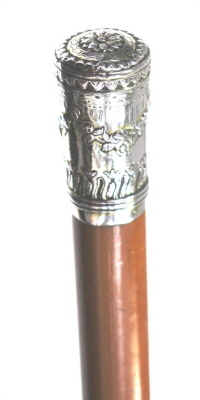 The cane holds an unusual horn ferrule with unmarked silver band. Beautiful condition throughout with minimal usage wear.